The Safety 1st Transitions is more than just another crib mattress—it’s actually the prototype for a new way of thinking in the sleeping assistance products industry for children. The fact is that the manufacturers of this product have a track record for finding the best ways to make products like this safe for every child. You can see how committed these people are to this agenda just by examining this mattress. Many things about it shout “perfectly safe” to anyone paying attention. Read on so you can see the specifics as to how these people are making children’s sleep experiences better and better one lucky child (those that get mattresses like these) at a time. This mattress is made by a company that is committed to making rugged, lasting and well-constructed products. This is evident from the way that this mattress has been constructed—this is true in spite of the fact that the construction of the mattress isn’t incredibly complex. First of all, the Safety 1st Transitions boasts of having a thermo-bonded high density fiber core; secondly, as the second layer, it has a water-resistant cover.It just so happens that the thermo-bonded high-density fiber core is 100 percent polyester, a natural material with a long history of being safe for clothing and other close-human-contact products. The Safety 1st Transitions comes in an unpresumptuous, barely-marked box that belies the fact that it contains a very valuable piece of nocturnal rest treasure. As you look inside and rip open the protective plastic wrapping you get greeted with the pleasant scent of newness—a scent sort of like the one you smell when you open up a new car. Okay, maybe this “car” can take you anywhere—at least not geologically. It can, however, take your child to many exciting places through the wonderful medium of sleep—provided that you get a comfortable mattress like this one for your weary child. First of all, the Safety 1st is a “First” in safety for a number of reasons, including the fact that it meets or exceeds federally established flammability standards, minus the harsh, toxic chemicals that are often used in the industry by lower-quality competing mattresses. This mattress is also Greenguard Gold certified in regards to indoor air quality. This great mattress is also PVC-free and, because of its anti-moisture/fluid quality, it keeps away both the bugs and germs that thrive on moist/wet surfaces. A quality about the Safety 1st that you can truly appreciate (if none other) is this product’s low weight. This is something that every parent, guardian and caretaker can understand in view of those times when accidents occur or things are spilled. Let’s face it: these things don’t happen at convenient times or when we deem ourselves most ready or agreeable. In fact, they happen at 2am in the morning, even though we may have to get up to go to work 4 o 5 hours later. Periodically you will have to lift this mattress or, worse yet, take it out of the crib or toddler bed—that’s when its weight (only about 7 lbs.) makes a big difference. Well, these instances won’t disappoint you about this product—at least not about this topic. Although this can’t be said about every mattress, the Safety 1st is relatively easy to keep clean. For one thing, if applying a wet cloth and mild soap won’t do it, you can take off the cover and throw it in the washing machine. Taking off the cover may be a pain but it’s good to know that it’s washable. Also, check out this article to care/clean a crib mattress easily. You’ll be happy to know that its water-resistant cover doesn’t contain any PVCs and that it can easily and quickly be wiped off after spills and unexpected (not that any of them are “expected”) accidents. The zipper-bearing cover isn’t technically supposed to be removed but, if you have a big enough mess or one that you couldn’t get to quickly enough, then you may not have much of a choice. Just make sure that, if you do wash it also, that you take precautions so that it doesn’t shrink or get damaged; accordingly, wash it like any other delicate item—i.e., using cold water on a “delicate” cycle. Then be careful how you have it dried. Fitting any standard-sized US crib or toddler’s bed, this mattress is 27.5 by 52 by 5 inches. The Safety 1st is made by leaders and innovators in area of safety for all the products that the company makes. This means that this mattress is bound to be better (at the very least in this department) than the competition bar none. As you begin to see all the safety features lovingly and expertly built into this mattress, you will see why these people have your child’s “safety” in mind in every sense of the word. Although durability can be a subjective term, there are things that you can point to that can help determine how long a mattress will last: the quality of the materials used to make the mattress; how long the company has been in business (the longer the more likely that they know what they’re doing); the workmanship involved—is it good or shoddy; etc. Well, this mattress can stick with you and your child for years to come, provided that it is treated right and not abused in significant ways. Seams can be important for a number of reasons. If there are loose threads, for example, baby can pull on them, thus setting the stage for rips and unsavory damage. Or the seam can become undone through normal tear and wear. The bottom line is that those rips can then provide a hiding place for bugs or something into which spills and accidents can seep into. This mattress, on inspection, doesn’t appear to have a problem with weak or poorly-sewn seams. Too much bounce on a mattress can be a problem for a number of reasons, not the least of which because it may induce the child to stay awakelonger than good for him/her. It can also be a source of injuries if, by bouncing around too much, a child gets to fall off a bed or crib (hopefully less likely off a crib) or injures him/herself in some other way. Apparently, the infant’s side has less bounce than the toddler’s side, which is as it should be. The bottom line is that the infant’s side is firm enough but the toddler’s side comfortable enough for both groups to be adequately accommodated. Corners can be very important but maybe not in obvious ways for many inexperienced people. Here’s the thing: you don’t want a mattress that will move around too much because it’s too loose in the crib or toddler’s bed. For that reason, you want mattresses with square corners (although some round ones may do) that will fit snugly in their cribs and beds. This will obviate there being gaps between the mattress and the rails/walls, gaps that can lead to limbs (or small heads) getting caught, a potential source for injuries or, worse yet, suffocation. The good news is that this mattress has nice square corners and, yes, it appears to fit snugly into the average standard-sized US crib or toddler’s bed. 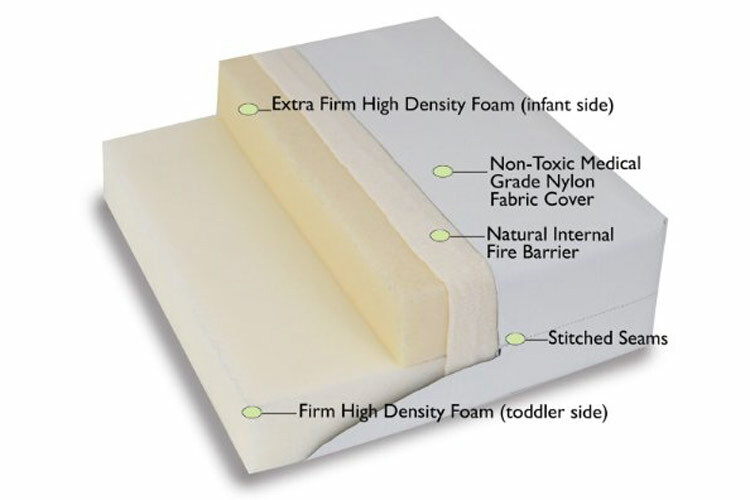 The infant’s side on the Safety 1st is more than firm enough for an infant, thus providing that well-needed resistance that they need to develop strong muscles, ligaments and bones as they move around and push against the surface of this mattress. It is, however, comfortable and cushioned enough (on the other side) for the more fickle taste of a toddler. You want to make sure that a mattress doesn’t leave too much space between the edges and the rails or walls (whichever apply to your child’s crib or toddler’s bed). Accordingly, one of the first tests you should perform when getting a new mattress is determining whether any gaps are being created where toys, other objects or bugs might hide; these can also be the place where injuries can occur, such as caught limbs or small heads getting trapped. This mattress doesn’t leave any such gaps and is, therefore, approved in this area. 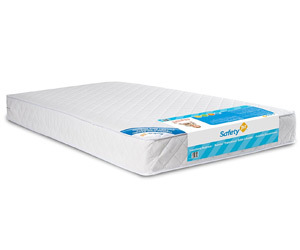 The Safety 1st’s surface isn’t the softest or most nurturing in the world—in fact, you might say it is a little bit rough if no sheets are covering it. For that reason, it’s best if you don’t plan to use it without sheets—then again, you should strive to abide by this rule in most cases. Since this mattress costs in general under $100, it’s safe to say that it is “affordable,” but that word is relative to a number of things, including financial means and what the purchaser expects for the money they will be spending. This mattress, from most indications, appears to be a good purchase for the price being asked but only you can determine if what you get is a good value for your unique needs, expectations and circumstances. This mattress is intended to be used by infants and, in time, to also serve as a more-than-suitable product for a toddler’s bed. This is yet another money-saving characteristic of this great product. You want edges on a mattress that are strong and supportive so kids don’t sink into gaps that may lead to injuries and medical complications such as suffocation and broken bones. The Safety 1st reportedly passes the “edge support” tests with flying colors. Good support means that children aren’t bouncing around or sinking too much into their sleeping environments. The “sinking” part is especially important since it can help protect babies and infants from SIDS and other medical problems. The high density in this mattress is primarily responsible for the good support this mattress amply provides. Proper support isn’t just about comfort but about helping the child’s body develop properly and painlessly. Mattresses that are too soft are like sand that doesn’t let a child’s muscles develop properly—well, this mattress isn’t “sandy” at all. Always buy the mattresses that provides good support for infants and toddlers. Having proper firmness and support are indeed very important but the third part of this triangle is “comfortableness.” More important to a toddler than a baby or infant, comfort is closer to, say, what an adult looks for when shopping for a mattress for him or her. It’s knowing that the surface will provide a pleasant experience, in addition to being good for one’s back and not being too fluffy or squishy. Well, this mattress has an additional comfort layer specifically intended for toddlers. This mattress isn’t marketed as having any specific temperature control features which can definitely be a minus for some mattresses. This doesn’t mean that it’s a bad mattress but what it does mean is that you may have to find anti-heat retention strategies of your own. This mattress doesn’t get the highest marks on breathability. Eventually, they may add breathing vents or other features but, for now, it is not exceptionally breathable. Unfortunately, this mattress isn’t the best when it comes to properly dissipating heat—in fact, it appears to retain it to some extent. All this means, however, is that you may not have to go overboard with covering your child with heavy sheets or super-warm blankets; it may also mean perhaps investing in a cooling-off cover that helps to dissipate heat better. Of course, always monitor kids to make sure that they aren’t overheating no matter what type of mattress you put them on. Also, make sure that the environment in the room is kept at a comfortable setting. Some people have reported an unpleasant smell when they get this mattress but, more than likely, this bad scent is coming from the plastic wrapping the mattress comes in. At any rate, let any product you get air out properly before you pass judgment. It makes sense that the people that make this mattress also make a number of other products in the “safety for kids” field. Although this mattress can use some improvements in some areas (like heat retention), it is nevertheless chockfull of safety features worth having. Beyond that, it appears to be a good value for the asking price. Although there are definitely some areas where this mattress can be improved upon, for the most part it has features and provides benefits that are hard to beat for the price. This is a mattress that will last you for a while and can be the source of safe, restful and body-building sleep for both your infants and toddlers for years to come. As such, it is a good buy for the most part.